CM: Evangelos Kouzounis paints for his soul. He believes that art must contain poetry and should be viewed poetically, to describe our feelings and to address our soul. The artwork is rhythm, which means it is an entity with a life of its own. A great part of the artwork concerns the world of its creator, where he may find refuge in order to escape from the prison of every day life. Kouzounis views painting as a relationship, for the viewer to feel that the artwork complements him and that he may start a dialog with it. 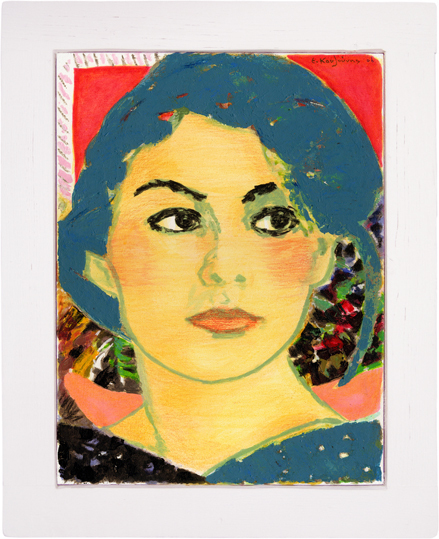 Evangelos Kouzounis' Woman in Pink Background presents the head of his first wife, Keti. It is one of a great number of portraits that he painted of her. In all these portraits he is after reproducing not her appearance, but the ideal that is symbolic of her. The present work is part of a group of four paintings of the same dimensions, but varying in terms of color and design. In this case the background influences the chromatic tone of the flesh. The face is painted over realistically with lipstick and rouge. The chromatic intensity of the entire picture is influenced by the gigantic placards and the advertising decors. The palette is somewhere between life and fantasy. If these colors stand it is because it was necessary for them to develop a relationship with one another. The color that dominates and binds the present painting is the 'caeruleum', which is at the same time blue and green with grey. The caeruleum claimed its position in the painting because it balances with the background's pink colors. Kouzounis' paintings contain within them multiple pictures. He says characteristically: "When we began our own paintings they contained within them the ghosts of the painters that influenced us. Great effort was required to project part of our own ghosts." Kouzounis manages his ingredients in such a way so that a special quality of truth may emerge, based on actual reality. To avoid the vulgarity of actual reality, he chooses his truth to conceal some aspects and to accentuate others. Thus the faces he portrays are far from objectivity and about its meaning. In every work of his Kouzounis risks by making new experiments. The present painting is legible cross wise, and in every of its quarters feature different patters. The lines are never repeated and the chromatic values always change. The painted frame on the upper left quarter operates compositionally while multiplying the composition, so that the gaze may find an exit. It is obvious that Kouzounis' art questions academic painting with innovations as much in terms of design as of color. His painting always aims for the absolute based on the contrast of white and black. While painting, Kouzounis opens 'holes' that are at the same time entrances and exits. Such holes are patterns which reveal other worlds behind them. For Kouzounis the sun has been a great influence, which - to him - is but a hologram filled at the same time with everything and nothing. In his art Kouzounis is concerned with the factor of luck - a diffused quality in the broader composition of his works - that is the virgin gaze, the surprise of sight, the unforeseeable. He claims characteristically: "Luck comes when you become conscious of the environment in which you are in, and when this happens you hear the bells ring."